In a conversation with Retailer Media, Animesh Maheshwari, Vice President, Riot - Retail Venture of Suditi Industries shares the industry insights while talking about the innovative categories in sports licensing and the new trends. Sports fever is at its peak with the sports leagues going on and this opportunity is leveraged by retailers with the launch of sports merchandise. In a conversation with Retailer Media, Animesh Maheshwari, Vice President, Riot – Retail Venture of Suditi Industries shares the industry insights while talking about the innovative categories in sports licensing and the new trends. What is the market share of Suditi Industries in sports licensing? Sports licensing has arrived as one of the fastest growing sectors of the licensing business. It has set a bench-mark as it leverages a global fan base which is either via a sports star, team or the sport itself. Sports licensing, accounts for about 11 per cent of the global market and in India it is definitely emerging with dramatically increase of global television exposure to Sports. Suditi forayed into sports licensing in the year 2014 with FIFA World Cup and later acquired top football clubs like Real Madrid, Barcelona and Manchester City. Moving forward with latest technology for manufacturing, strong systems and a good work culture, the company is poised to find its way through such international sports brands in the times to come to build a strong market share. Who all are the prominent licensors associated with you for sports licensing? We have been fortunate to collaborate with Fifa for World Cup 2014, also with regards to clubs we associated with Real Madrid that was via Adidas, FC Barcelona through Viacom18 and Manchester City mediated by Bradford License India. These associations have widened our offerings and customer base by tying up with sports clubs to co-sell merchandise. What are the innovative categories in which Suditi has marked its presence? What is selling more? Thinking outside the box is paramount. To commercialize the domestic fan base, it is essential to develop stable and durable product categories that will entice the customer base to make purchase on regular basis. We have been manufacturing in the areas where our strength lays in; exploring new techniques in the categories we master in has been our proverb. Among various techniques, our graphic prints, varied washes of fabrics have been selling well. We are to present new styles like reversible jackets, burnout washes, camouflages, etc and with sports apparels we tend to give it a lifestyle approach for the customers who we know will find irresistible. What is the new trend in sports licensing? The major trend offering for this year has been applying a lifestyle feel to the sports category. This has pushed the growth drivers, as attention has been paid to the kids market. The infusion of lifestyle to sports has upgraded the sports licensing market which has allowed even the non-sport followers to be inspired by the designs, thereby increasing sales. What is the difference between promotional licensing and product licensing? Various forms of licensing programs are followed globally to bring characters to life and to support merchandise. 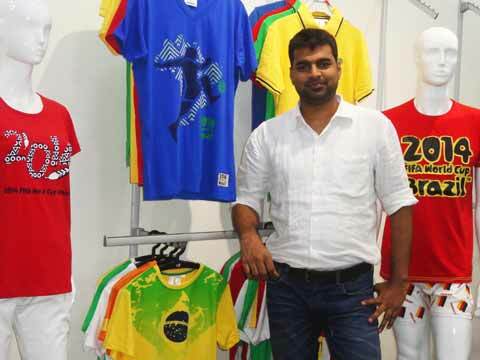 Product licensing focuses on manufacturing merchandises. A license is granted to the manufacturer for one of product ranges. The latter will design their products with the characters licensed and subsequently market and distribute these products in their regular distribution channel. On contrary, promotional licenses concept aims to actively support the sale of another product. This can be done by showing a character on the packaging of the product, in which the consumer can eventually obtain a product based on the character. However, in this type of licensing there is restriction on the distribution channels as well as period of promotion.